If history has any use it is for the living, for examples and encouragement, to show us what is possible. In history can be found models of the way things might be done to change the future, and models of what has failed; and errors not to be repeated. The resurgence of the repressed in history can give strength to the anarchist, the radical, and those who would struggle for control of their day-to-day lives. If we learn well from history we know we are not alone, we have never been alone, and the future is ours if we make it so. It is for the living generation to fulfill the repressed and forgotten attempts at rebellion, at revolution, at taking possession of our own lives. 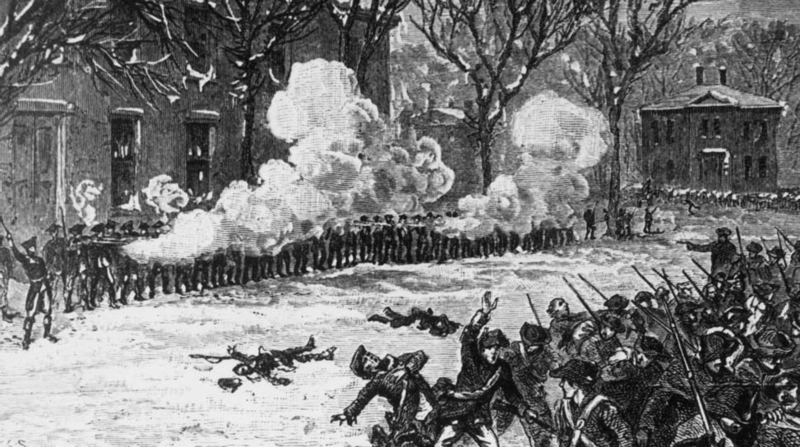 In western Massachusetts, the stronghold of the rebellion, the government in Boston was felt to be virtually an oppressive foreign government, no better than the one they had just gotten rid of. Half of the western towns did not send representatives to the General Court. Instead, they continued to operate in the same manner as during the revolution, when there was no real government. Local matters were decided at town meetings. When matters of common interest were involved, county conventions were called; in each town delegates would be chosen and given exact instructions as to what position to take on every possible issue; on their return they would be questioned at great length as to what took place. Among the resolutions passed by county conventions were ones calling for immediate re-organization of the state government, the issuance of paper money to be loaned to debtors (an extremely popular plan to end the economic crisis), an end to prosecution of debtors, and reduction in taxes and state spending. The rebels retreated north to Pelham, Shays' home town, where they found a large quantity of provisions sent from Berkshire. Lincoln's army arrived a few days later and stopped about ten miles away--passing through Amherst, they found hardly a man in the place, as they were all with the rebels. Negotiations took place between the two armies, the rebels offering to surrender if given a complete pardon. "I understand that there is a number of my countrymen condemned to die because they fought for justice. I pray have a care that you assist not in the execution of so horrid a crime, for by all that is above, he that condemns and he that executes shall share alike ..
His name was Shays; it should either be Shays's or Shays' Rebellion. I think one aspect not mentioned here is the demand that debts be paid in hard currency, that is, gold or silver coinage. the farming villages in New England in that era didn't see much currency. most were living by subsistence farming, basically it was a peasant society. local merchants didn't require hard currency. but after the independence war, the big merchants in the coastal cities, who controlled the state government, started demanding specie (hard currency). Some say this was due to demands placed on them by British merchant & shipping interests, in the context of an economic depression. Because the villages lived largely outside the money economy, they had a hard time meeting this demand. In Rhode Island there was a similar revolt that led the state legislature to print paper money, to reduce value of debts. The farmers in Massachusetts demanded the same, but the merchant elite were intransigent. as this article mentions the 1780 constitution was highly undemocratic. Gary Nash points out that the popular vote on the constitution actually had a "no" majority (according to an historian who carefully examined the reports of the votes from the various towns) but the elite controlled legislature lied & claimed it was approved. The imposition of requirements to pay debts & taxes in currency (and increase in state functions such as public education in 1830s) was a key pressure that led farmers in the northern states to move to a commercial cash crop orientation in the early 1800s, and was thus a part of the process of the emergence of capitalism in USA, which existed only in a sketchy form in colonial period. i don't know how it is in MA, but this rather major event was certainly not taught in schools in NY. but then the Anti-Rent Wars weren't taught either.